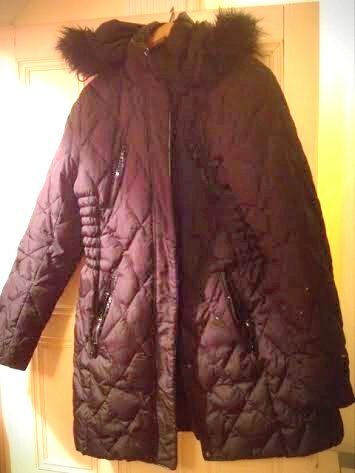 A few brief years ago, I finally reached what I consider a small plateau of maturity – determined not to freeze through yet another Very Cold Winter, I purchased an insulated down-like coat that was long enough to cover my rear end, that both zipped and snapped all the way up the collar, sporting a hood with fake fur trim for extra wind-blocking. One that was roomy enough to wear a significant sweater or a fleece vest beneath, for those really frigid days. I chose a black coat, which would absorb the heat from any sunlight that might be shining upon it, and hopefully not reveal the fact that I often eat copious amounts of chocolate while driving. One that would match with just about anything I decided to wear, and easy to accessorize with. Years beyond the point of wearing cute little jackets that just hit your waistline (um…OK….what waistline..?) or just cute little jackets that hit anywhere, I had been holding out on purchasing a serious coat up until then. Practicality and comfort is where things are at now. At This Age. The cozy, intelligent choice is what I decided to be about. The only thing I really hate about it is that it has a double zipper. There is a bit of embarrassment admitting that I have struggled since childhood – and still struggle – with double zippers. Lining them up in order to get them zipped creates a low to medium level of anxiety for me. 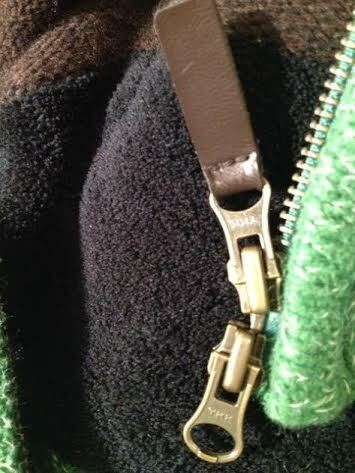 Impatient and frustrated with them, using double zippers are a basic skill I never quite mastered. Inevitably, at some point the bottom of the zipper will come up and then not want to come down. Or I am just unable to properly line up the bottom and have it zip up in the first place. With long coats they are difficult to avoid, but I try to not buy something with a double zipper if I can help it. When I do find myself dealing with them, I never unzip the bottom, because if I do, I know I will be doomed to a zipper disaster. On a recent visit to a friend in New York City, I traveled by bus and wore the black coat, with layers beneath it, in anticipation of some icy city winds and deep cold. It was sleeting a bit when I left; it was a good time to be wearing it. 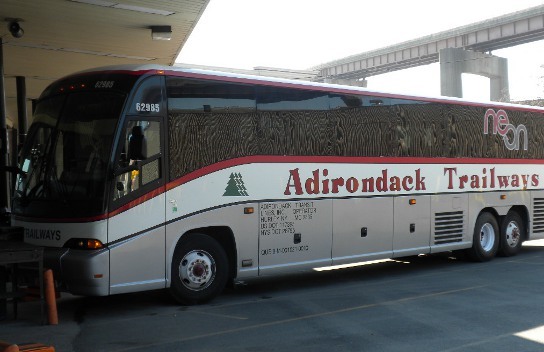 However, the temperature on the bus was a humid seventy-eight degrees. I know this because I was sitting only two seats back and I could see the inside/outside temp gauge on the driver’s dashboard. Just to add to the discomfort, the damp, steamy atmosphere within the bus seemed to spark a hot flash, a runny nose, and a few small fits of coughing. So I started peeling off layers and piling them on the empty seat beside me, where they were not compact, but lay in rather a high pile on top of my backpack, which I kept near me for easy access to all sorts of goodies. Prepared, I settled in for the rather long ride with my magazine, my cell phone set to the bus WiFi, my bottle of water and an energy bar. Two stops later and the last pickup stop before our bus went express the rest of the way, people began to board and I just had a feeling someone was going to try to sit next to me, even though there were plenty of empty double seats on this off-peak bus. It’s funny how sometimes you just know when something is going to happen. Being the anti-socialite I was feeling at the moment, I tried to discourage this in the most subtle of ways. I did not make eye-contact with anyone boarding, but decided to look a bit Engrossed in my magazine, and perhaps look a little Crazy too, while extending my coughing fit a bit longer – long enough to be an undesirable seat partner. I hitched my frizzy, purple ponytail up a bit higher on my head, stretched out my legs a bit, coughed loudly into my hankie and sent out some serious “leave me alone” vibes. But apparently I did not appear as Engrossed or Crazy or Sick as I had hoped. Honestly, would you want to sit next to someone with crazy hair and a big pile of stuff on the seat, who was incessantly hacking and wiping their nose, while avoiding looking at you and sending off a mildly hostile vibration? I wouldn’t, but clearly there are people who do, because a woman who appeared about ten years older than me boarded and made a beeline for the seat I was sitting in, asking me – just like that – to move over. So now there are two of us crammed into that hot little area, with my stuff piled up on my lap. She put her arm rest down with a bang, and for the next two hours, out of the corner of my eye, I watched her make long columns of tiny writing in a small notepad with yellowed pages that she held in her lap. I threw in a few coughs just for good measure, but she wasn’t budging. When we finally arrived into the city, she wasn’t real quick to get up, and so I struggled into my coat while sitting down. Wouldn’t you know it – the double zipper would not zip, but hovered jammed about one-quarter of the way up. I stood up and wrestled with it, at which point the center unzipped itself and separated, while the top and bottom end remained tightly closed. Vexed, I got myself off the bus and continued to fight with it while walking through Port Authority, twirling around in circles with my backpack on my back, hot-flashing and sweating with frustration, cajoling and finally forcing the thing to open. I was able to re-zip it, but from then on, it would no longer cooperate. Arriving at a wonderful Turkish restaurant that evening, I soon discovered I was trapped inside my coat and could not get free of it. Unzipping it as far as I could, I shimmied it down around my waist and sat there eating dinner, and then shimmied my way back into it, until later, when I could spend some time to tackle dealing with it. I have since found myself trapped like a dancing mummy inside that coat at doctor appointments, meetings and all other manner of events. It’s a nice, warm coat, but it will suddenly part open and jam without warning. I am beginning to really dislike it. I’ve had it too long to return it anywhere, so I am just going to have to deal with it. I actually wonder if it is possible to crazy-glue the bottom zipper down so that it never has to be engaged at all. Has anyone ever done that? I am afraid that might be the end of the coat if I try that…but I wonder. However, it’s just not this coat. A few months ago, I was standing in the kitchen with a couple of friends, trying on a beautiful sweater. As I slipped into it, everyone was saying “That looks sooo great on you, what a perfect sweater for you!”. But as I went to zip it up, I noticed that it had That Kind of Zipper. With dread I said “Oh no, it has a double zipper! I don’t do well with double zippers!” Sure enough, I could not get it to engage and zip it up, at which point they both looked at each other with quick eye-rolls and then at me with some disbelief before saying, “Are you kidding? It’s easy! You just have to line it up and do THIS“. Each one then leaned over me and independently showed me how to easily do it. Apparently you have to hold the bottom zip a certain way while pulling back the cloth, and then either hear or feel the “click” it makes when it engages. They made me do it over, and over, and over again until I could prove to them that I could handle a double zipper all by myself. It was like being in kindergarten. Of course later, back on my own, I still struggle with it. Just about each and every time. I don’t know why that is. It reminds me of both my grandmother and my grandmother-in-law decades ago, ripping out the stitches of what I knitted wrong and having to start over again. “Do it again.” And again. And again. Until I gave up on knitting altogether. It is times like these where I reflect and have to wonder what is wrong with me. It’s not just zippers either. But that is for another post. We are in for another cold freeze in a couple of days. I intend to start off the New Year the same way I intend to approach my double zippers – with flexibility and patience anew. This entry was posted in Are you kidding me?, Humor, Uncategorized and tagged approach to New Year, frustration, winter coats, zippers. Bookmark the permalink. Dry cleaners usually also do alterations. Once the weather is done – take the coat to the dry cleaner and have them change the zipper. Check done. I laughed out loud reading this; I, too have struggled with double zippers. Funny thing is, they are considered the best zippers, generally in more expensive clothing. I’ve had nothing but problems with double zippers, they’re a bug not a feature. I recently bought some dish soap in a special new container. It squirts from the bottom and can only be stored standing on it’s bottom, so to use it one must pick it up with one hand and hinge open the stopper with the other – two hands to dribble some soap. Maybe that’s an improvement over one handed use in a culture where the population is moving to typing with two thumbs instead of 10 fingers. Or maybe it’s just marketing triumphing useful design. I just had to laugh at this. Because you know, what you say is true…they are a bug, not a feature. Personally, I think the last really good invention was the cap forlaundry detergent bottles, which swirl the detergent back inside after you finish pouring instead of letting it drip all over you and the bottle. That, and the toothpaste caps that are attached. Both of which I actually invented in my mind before they ever were patented by someone else. But of course, that is the story of my life, the missed invention boat…..